America's cities: celebrated by poets, courted by politicians, castigated by social reformers. In their numbers and complexity they challenge comprehension. Why is urban America the way it is? 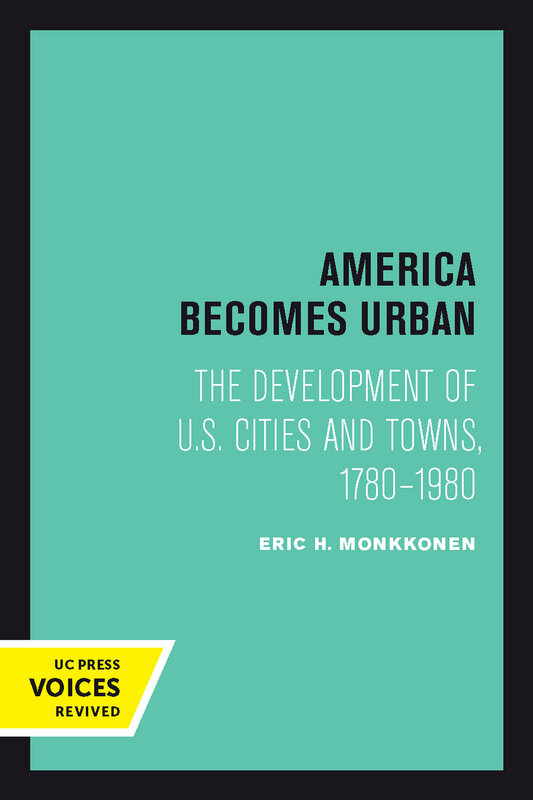 Eric Monkkonen offers a fresh approach to the myths and the history of US urban development, giving us an unexpected and welcome sense of our urban origins. His historically anchored vision of our cities places topics of finance, housing, social mobility, transportation, crime, planning, and growth into a perspective which explains the present in terms of the past and ofers a point from which to plan for the future. This title is part of UC Press's Voices Revived program, which commemorates University of California Press’s mission to seek out and cultivate the brightest minds and give them voice, reach, and impact. Drawing on a backlist dating to 1893, Voices Revived makes high-quality, peer-reviewed scholarship accessible once again using print-on-demand technology. This title was originally published in 1988 with a paperback in 1990. Eric H. Monkkonen was Professor of History and Policy Studies at the University of California, Los Angeles. Author of The Local State and America Becomes Urban, he is also editor of the eleven-volume Crime and Justice in American History.